Iseabail MacAskill – Many of us in the High School were very sad to hear of the passing of the renowned Gaelic singer Iseabail MacAskill. Iseabail visited Gairloch High on many occasions over the years to lead workshops in Gaelic singing and spent an afternoon with us last September. Our memory is of a vibrant, talented lady who enjoyed passing her skills and knowledge on to the younger generation. Bidh sinn ga h-ionndrainn gu mòr. Staffing Reductions – Parents received a letter indicating further reductions to staffing levels in the school from next August as a result of falling rolls. All current subjects will remain. Further details are available elsewhere in this issue. The Parent Council is holding a meeting on Wednesday 13th April in the School and all interested parties are welcome. Click here to visit the Parent Council website. Idiscover – The last idiscover day of this term took place last Friday. On this occasion, S1/2 pupils were involved in three experiences. Social Gaming looked at on-line games and how different roles were required to develop these. Pupils designed their own ideas for games and these were presented to the whole group. Science of Champions, run by the Manchester United Foundation, demonstrated the skills needed to run coaching sessions. Even those with no interest in football found the day rewarding. The third experience was held at Flowerdale. Transform It, as it was called, encouraged pupils to use the environment to reshape their experience of seeing space and place. Unfortunately, the day was wet and windy but this did not deter pupils from participating fully. The providers, Whitewave from Skye, commended the pupils highly for their enthusiasm. S2 History – The pupils have been learning about the lives of child workers in the mills, factories and coalmines during the 19th Century and were amazed to discover just how hard and what long hours these children, some as young as five or six, had to work. Last week the classroom was turned into a mine with tunnels, trapdoors and a trolley for transporting the coal so that they could play the parts of trappers, hewers and bearers. One group particularly enjoyed transporting “injured” children to the bottom of the mineshaft on the trolley, whilst another group worked extremely hard to fill the “baskets” with “coal”. Check out the photos on the school website! The local Gaelic dialect. The interviews will be recorded and the second part of the project will be to listen to the interviews again and to analyse the local Gaelic dialect. We have already written to various people asking them if they would be willing to take part in this project but we would like to issue an open invitation. Taking part will involve coming to the High School on Thursday the 5th of May and being interviewed in Gaelic for about fifteen minutes. If you would be able to come in on this date, please get in touch with the school by telephone (712275) or by email. 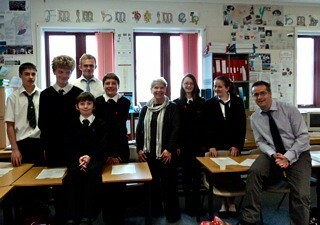 Target Event – Recently all pupils in the High School listened to presentations from local employers. The lasting impressions from the pupils seems to have been how dependent we all are on each other in this community and the varied backgrounds of the employers, compared to what each is doing now. Gairloch High school pupils, who have opted for Hospitality, will be looking forward to working with local businesses, West Highland College and Celtic Fringe. Pupil Success – Karen Wotherspoon has gained awards from Gairloch Pony Club in Pony Grooming Skills, Handling Skills, Feeding Skills, Saddlery Skills, all at a grade of Stage 1. Morven MacRae & Charlie Mays have each achieved the Bronze DofE Award. British Orienteering Federation – Young Leader Awards have been presented to the following pupils: Morven MacRae, Rhys Leonard, Reece McDonald, Kieran Morrison, Connor Brown, Conor MacDonald, Sandy Garrioch, Jasmine Easby, Jake Bulmer & Rebecca Dreisbach-Pollington. Well done to all the pupils mentioned above. Girls Inter House Hockey – A good evening, good team spirit, lots of laughs and even some skilful hockey took place after school recently! In the junior competition Kerry got 10 house points and Maree 15. The seniors fought hard to get past each other’s defence managing to sneak in a few goals. Kerry finished 3rd with 5 house points, Tollaidh 2nd with 10 points and congratulations to Maree again getting 15 points. Boys Inter House Hockey – In the junior competition Maree got 10 house points and Tollaidh got 15. In the senior competition Maree got 5 house points, Kerry 10 and Tollaidh 15. Hockey is now finished for this session. These hockey events were organised by Mrs. Hildrey. Well done to all teams especially the house captains and senior helpers. Rugby S4-6 boys & girls have been investing in mouthguards to play rugby under the supervision and tuition of Mr Stewart. S1-3 boys & girls met the following evening after school to play in the mud! According to Mr. Stewart physical contact will be limited for the moment! Important Dates – School closes today for the Easter Holiday however Study Club for S4, S5 and S6 pupils will take place on Monday 11th, Tuesday 12th and Wednesday 13th April. Pupils and staff return to normal classes on Tuesday 26th April.